I completely missed this cover last month when it was released. 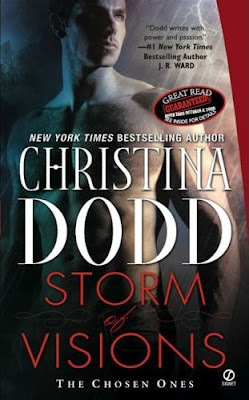 Storm of Visions by Christina Dodd is the first of two books in a new paranormal series called The Chosen Ones, that is a spin-off of her Darkness Chosen series. The book will be released August 4 with the next book, Storm of Shadows following closely on its' heels September 1. Visit Christina Dodd's website here. Jacqueline Vargha has always run from her gift. Now Caleb D'Angelo forces his way into her life, demands his place as her lover, and insists she take her place as one of the Chosen. She flees, he pursues, but she can no longer deny her visions, or the dangerous man who is her downfall … and her destiny. I'm really looking forward to this new series. I loved Dodd's Darkness Chosen series. I haven't read this series either, sometimes I wonder what I have been reading...lol! I'll look for the first book. I've read the Chosen series too Cybercliper, so I was happy to here about this new spinoff series. Dottie it's a good thing that there are always new series to be uncovered.